In 2012, I posted at least 100 pictures from Taiwan on my taiwanreporter Facebook page. Some of them proved to be very popular and were shared and re-shared by a lot of readers. Time to announce my very own 2012 Taiwan Hall of Fame! The number of unique people who have created a story from your Page posts. Stories are created when someone likes, comments on or shares your post. In my case, for 2012 this number ranges from 1,509 (most popular photo) to 243 (10th most popular photo). In June 2012, German public television ARD broadcast a 30 minute documentary about Taiwan’s nature and folk customs. I assisted the TV crew during the filming. The video is still online. In July, ARD broadcast the next report from Taiwan: About Maestro Wu from Kinmen, who turns old grenades into new knives. Do you still remember the „What people think I do“ Facebook photo meme? I contributed a pic as well. 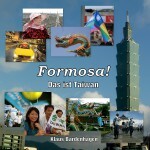 Having witnessed many interesting events in Taiwan, like elections and protests, I published a little photo book. It’s called „Taiwan: Snapshots of Democracy in Action“, and the text is completely English/Chinese. You can download an e-book version for less than US$1. Check it out! Taiwanese students are protesting for media freedom. I wrote an article about Taiwan’s new student movement for the German daily newspaper taz. After Taipei was named one of the world’s best cities to have coffee by some website, I published my collection of Taiwanese coffee shop logos. On my way home, I saw this cute Christmas decoration in the Yongchun subway station. Some readers apparently liked it, too! Time magazine published this map which clearly depicts Taiwan as not being part of China. I like that. After the first trip resulted in the reports mentioned above, my colleagues from German TV vame back to Taiwan and shot more scenes. I accompanied them high into the mountains to film the tea harvest. Check out my picture gallery about German TV coming to Taiwan. I found that, despite all the construction going on for years, many Taipei residents do not know what is awaiting them. So I posted this map. The expanded MRT system will be awesome! You can still like and share all these pictures on Facebook. What is your favourite Taiwan photo on the Web? Please post a link in the comments. I am a German reporter living and working in Taiwan. Read more English posts on this mostly German blog. Follow me on Twitter, Vine or Google Plus. Taiwanese girls with Western partners: What is a Xicanmei 西餐妹 ? SunMoon Lake is my favorite 1. Thank you! Feel free to click through my picture galleries on Facebook and Google Plus (links to the pages in the top right corner).